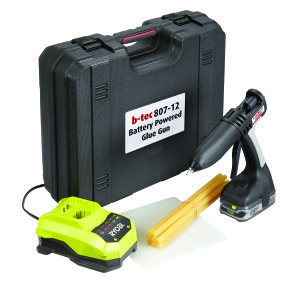 Completely portable The B-Tec 807 is powered by a rechargeable battery, allowing it to be completely portable. With no power cables, users have the ability to work virtually anywhere. It offers great accessibility, making it ideal for trickier applications such as attaching low-voltage cables for security and telephone installation, holding under-floor electric heating elements in place before screeding, window dressing and creating exhibition displays, carrying out car body-work repairs, and attaching carpet gripper to floors, to name but a few. 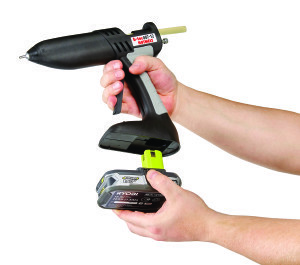 Quick and simple charging The B-Tec 807 has been designed to use the widely available RYOBI® 18V 1.5Ah lithium+ consumer power tool battery system, which is also used to power a large range of RYOBI® portable power tools. This battery, along with its charger, can achieve recharge times of approx. 60 minutes. So it’s easy to keep your gun charged and ready to go. Plus, the battery includes an on-board 4-stage fuel gauge to indicate how much charge is remaining, making it even easier to know when you need a top-up. 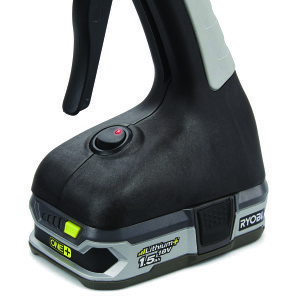 Easy to use With an adjustable full-hand lever trigger and softfeel grip handle, the B-Tec 807 is very comfortable to use. It’s also been designed with a narrow profile and an extension nozzle that’s fitted as standard, so it’s even easier to apply glue accurately. Which is handy, as the B-Tec 807 takes the full range of high performance Tecbond 12mm glue sticks. Fast warm-up Just flip the B-Tec 807’s illuminated on/off switch to start it up, and it will reach operating temperature in only 3 minutes – so it won’t sap away the battery power as it’s heating up.